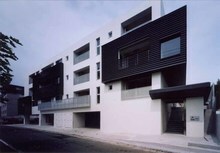 This apartment complex of 17 dwelling units places in Fukuoka City. The site is on the border of an old primitive road with place containing a buried cultural property and a systematically developed public apartment complex. We have height-limit of building to make the building harmonize with the surrounding environment. We try to propose various ways of living under this height-limit. We planed two buildings not to disturb lights and winds to the house next to the building site. One building is flat type and the other is maisonette type. The exterior is designed to unify the owner's house which is after "refining" and stands next to Deco BLD. Specifically, we considered to fit its beautiful city landscape by using white splay tiles and black garvanised stealseats That is represented by an image of "white wall of Fukuoka castle."